I have an ongoing romance with the notion of apples. Maybe even more than with the apples themselves. Ruddy cheeked and fragrant, apples are a treat for both the eye and the palate. And the variety of projects apples inspire in us: festivals, cider hard and sweet, sauce, butter, pie, dried, spiced, stuffed, baked, fried, vinegar, wine, cakes, the possibilities truly are endless. I realize I’m jumping ahead with the apple talk just when the long-awaited peaches are hitting their stride. Apples are the fruit of fall here in Pennsylvania. Crisp, snappy days = crisp, tart apples. Trust me; I’m never one to rush a seasonal moment, but there is a timely reason I’d like to talk about apples today. Bling raiding the apples again....She thinks nobody knows...Who's she fooling? Raising great apples is an art that fortunately is practiced with care by knowledgeable orchardists around here. I’m not one of them, but I am enthusiastic about the possibility. Fortunately for me, apples are pretty tough and for the most part want to thrive. If I can just figure out how to stay out of their way, I should have more than enough for our needs. 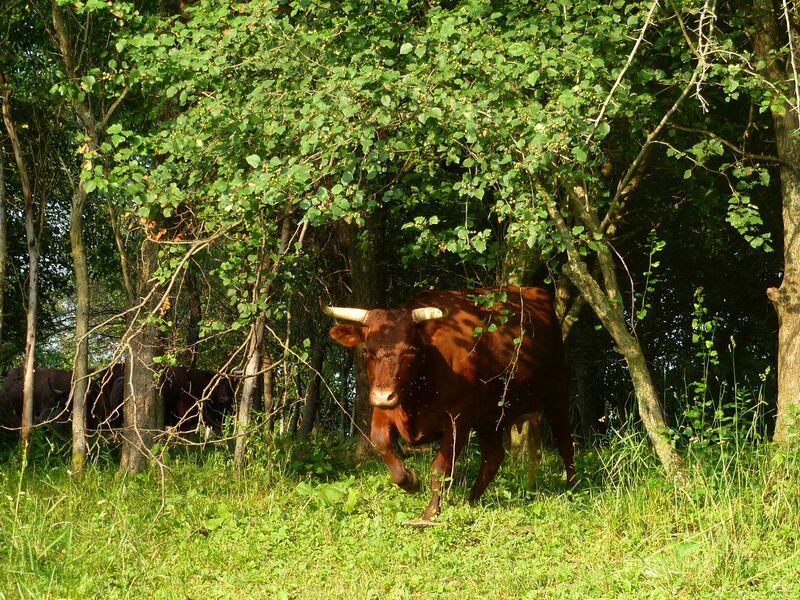 That is if I can keep some cloven hooved Ladies we know out of the trees…. One little considered industrial use for apples is the making of commercial pectin. This pectin is mostly imported in bulk from Europe and packaged in the United States. But really, what is it? As it turns out, pectin is a water-soluble substance found in the tissues of all fruits, though some have much more than others. It acts as a thickening and jelling agent. Typically, pectin is extracted either from tart apples or the white pith found under the peel of citrus fruit, both naturally high in pectin. As the citrus pith tends to retain a bit of bitterness, most commercial pectin is derived from apples. Commercial pectin was a great boon to many overworked home preservers upon its introduction in the early 1900’s. It’s use made preserving much more forgiving and yielded more standard, reliable results. Ever useful apple pectin stock. The great pectin debate among jammers is an interesting one. Myself, I tend to pass on the commercial pectin, but I don’t really have any super scientific reason for my avoidance. I just really don’t like stiff, rubbery jam or jelly and going without commercial pectin gives a gentle, softer texture that I love. And, a failed batch of jam isn’t really a crises in my book – I love ice cream topping, glazes and syrup almost as much, so what’s the big deal? Smugly confident with my anti-commercial pectin decision, I read Linda Amendt’s most helpful book, Blue Ribbon Preserves. 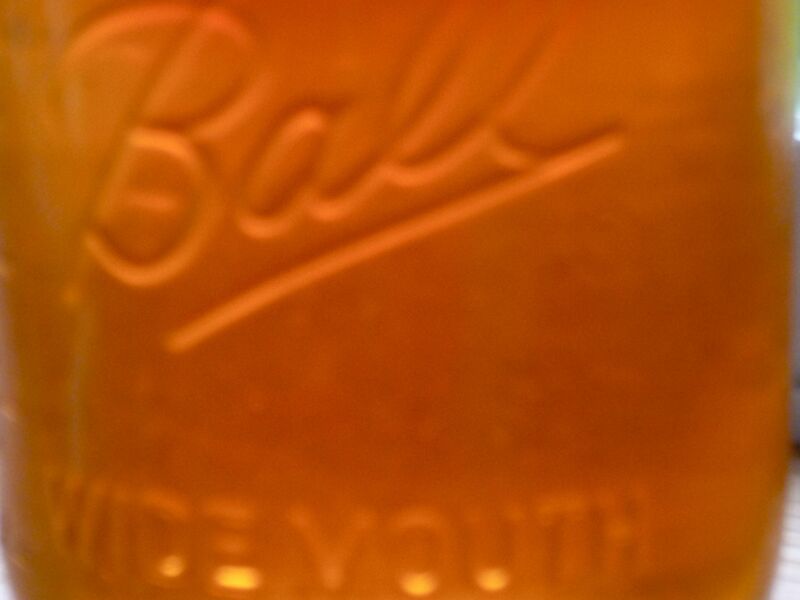 Linda is firmly in favor of using commercial pectin, particularly in its liquid form. She is also decidedly against the use of homemade pectin stock. If you haven’t read her book, and you are a student of the science of preserving, you really should. It’s indispensable in my kitchen not just for the recipes (which are plentiful and good) but for the why’s and insider tips that help me deviate safely. Needless to say, Linda cast more than a shadow of doubt on my opinionated prejudice against commercial pectin. I think of making jam and jelly as a Devotion and form of gratitude rather than an assembly line process. Commercial pectin is a shortcut, an equalizer that lowers the quality of the excellent and raises the quality of the poor to achieve a consistent good enough. A bailout of sorts. It makes me sad that consistent has come to define good with regard to food in America. Agreed, embracing true regional and artisanal food means risking a really disappointing experience from time to time. Maybe even the occasional bellyache. But, that’s the price I’m willing to pay to enjoy that sublime surprise you’ll rarely find at any chain restaurant or grocery. 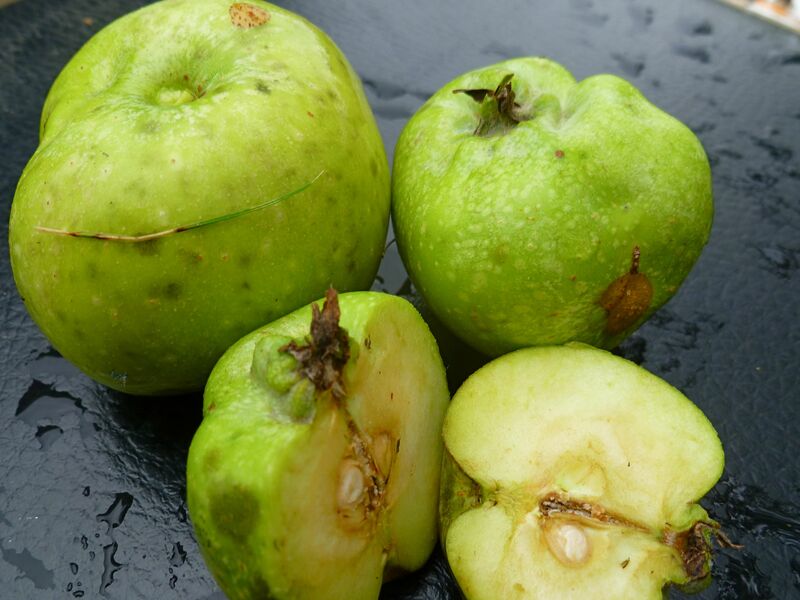 Ruthless thinning makes the remaining apples healthier and larger. For healthy organic apples, it's important to pick up the windfalls anyway so you may as well make jelly, right? If you have an apple tree of your own, or a friend willing to share theirs, apple pectin stock is a great way to use the immature, tart apples that fall or are thinned mid summer. 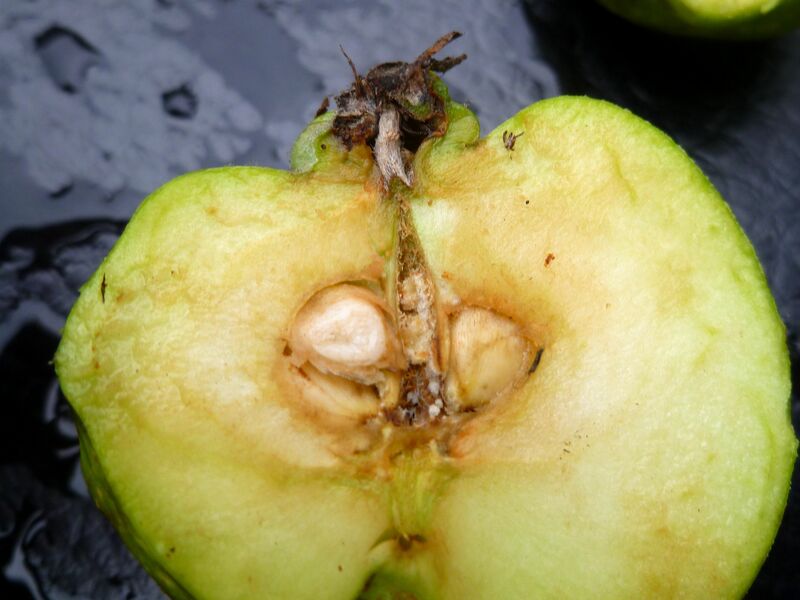 Losing excess apples makes the remaining crop healthier and the fruits larger. Using the unripe green apples to make home-made pectin stock makes sure nothing goes to waste. Forgive my geekiness, but I think that’s pretty exciting in spite of what Linda Amendt thinks. I use the apple pectin stock to glaze sweet pastries and savory roasted meats and make preserves and jelly from fruits, herbs or veggies without enough pectin to jell on their own. And, it’s already jelly, so if I never make anything further from it, it’s still good on toast or in cocktails. But my most pressing reason for making it is so I can use it later to make onion marmalade. Pectin stock is not so much a recipe as a formula; learn the proportions and the procedure is easily adaptable. 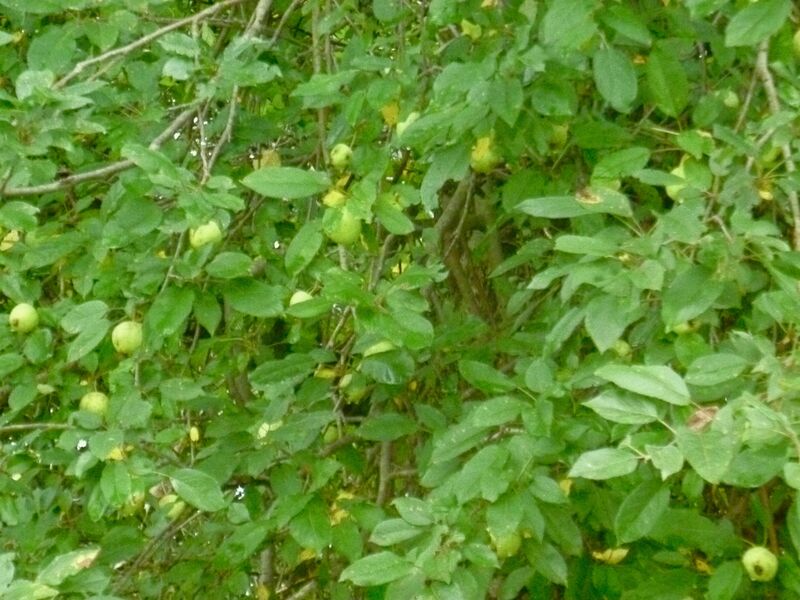 I’m thinking of tart green apples today, but stock can be made from other fruits as well; crabapple, red currant, citrus, certain plums, quince, gooseberries – anything with a high natural pectin content. The thing about apples that makes them so useful is that their flavor is mild and willing to take a back seat so other flavors can shine. I love that I’m not importing something from afar, I know my apples haven’t been sprayed with pesticides and they’re free – my favorite price! I accept the variability of the levels of starch in my apples and the varying content of pectin from one apple to the next. If the worst penalty is using up a batch as ice cream topping or syrup when my jam didn’t set, that’s a penalty I can happily accept. Honestly, it’s rarely happened. What about you? Commercial pectin or no? I’d love to hear your enlightened opinions in the comments below….. I am not the best canner but the when I used commercial pectin my jam was rubber! Still didn’t go to waste, piggies love my goops! I have some blackberry jam that did not jell but it is awesome on pancakes! Gooseberry jam doesn’t need pectin. it sets up so nice. I still have pectin but I don’t plan to use it again. Guess it is collecting dust. I love that you are growing apples! I can’t keep a tree alive long enough! My other fruit trees and bushes thrive. have to grow it myself! Trust me, the fact that I have apple trees has nothing to do with any skills of mine, lol. They just seem to be pretty hardy around here…. This is a great post. I’m with you about taking a few risks when eating seasonally. And I learned so much about pectin. I haven’t made jelly or jams in a really long time and I did use commercial pectin. I’m going to pass this along to my sister in law who has an apple tree. What a great post! I never really new what pectin was, as I don’t make my own jams or jellies. However, I can say that our family likes the jams that mix easily and are not the hard jelly-type. Also, now I know what to do with the really tart, underdeveloped apples. I hate to waste, so this will be perfect. 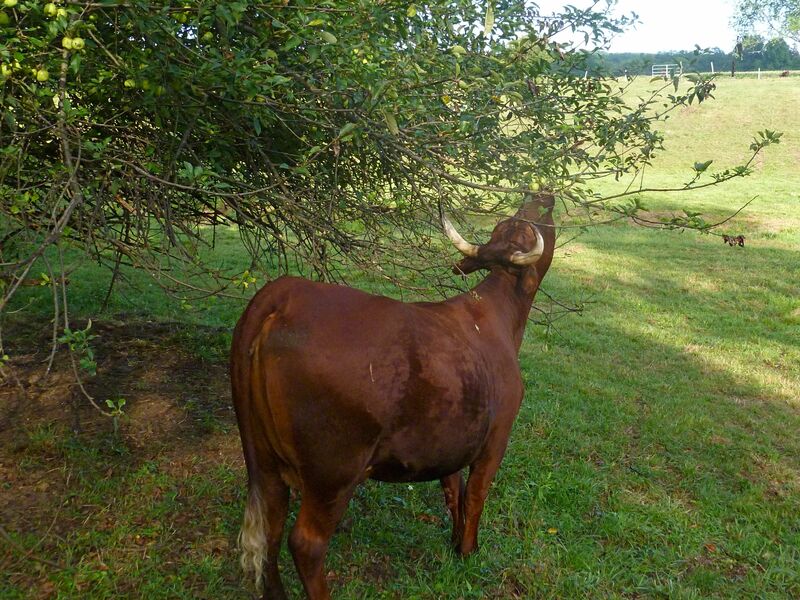 Tammy…I’m always happy to share apples! Thanks for passing along this post. got your own apple tree? I’m pretty solidly anti-pectin. Maybe because the first jam (and only for many years) I made was apple butter… It just seems a bit of a cheat, unless I’m trying to jam something that REALLY doesn’t have enough pectin of its own. But usually I don’t really have a problem getting the jam set enough for me. Which is the other side of the equation. I don’t like hard jam, and am generally using about half the jam to flavor homemade yogurt. For me, soft and goopy is infinitely preferable to hard. I actually WANT the jam to mix easily into yogurt. At a certain level of hardness, one might as well keep going and have Turkish Delight! New here, I have an apple tree question or maybe you have a post on trees that I haven’t found yet. I have two apple trees, we moved here 3 Springs ago :) My apples are so buggy, I want organic apples, but I haven’t found a real way to deal with this problem. I have August apples and they are about ready, but I fear they are all lost. We prune, but need someone to come out and do a major cut back. We did manage to get some sauce and butter last year, but it was horrible cutting most of the apple away. I have a food mill, expecting it to help ease the process, but now, I won’t have any apples unless I buy them. Hi Emily, thanks for reading. I’m not the girl to ask for apple growing advice; I only know how to eat them. You may have already done this, but I would check out The Apple Grower: A Guide for the Organic Orchardist. Thanks! I will get it! !